Trouillard Brut Extra Selection NV is selected from 15 different vineyards located in the Marne Valley, in the Aube and the small Mountain of Reims. Trouillard Brut Extra Selection NV is made of 35% Pinot Noir, 35% Pinot Meunier, 30% Chardonnay. With a light amber color with fine bubbles, full-bodied with a full mixture of white fruits. Dominating taste of hazelnuts and grilled almonds. This crisp, delicate, fresh, creamy and elegant champagne, with just a touch of yeastiness, is sure to enhance any special occasion or meal. A very classic and delicate Brut. "Medium gold color with a rich, seductive nose of roasted grains. Shows an elegant attack and a very fine, rich mousse. Finishes very dry but long. Dried lemon peel and toasted bread are evident on the richly textured palate with notable mineral character. Finishes very dry and long." The wine is produced in very limited quantity from the estate's oldest vineyards (80 years old vines) and is fermented in 2,000-liter open-top fermentation vats. Our winemaker punches down the cap by hand three times a day using the traditional pigeage method to ensure optimal extraction. The name of the wine is the surname of the San Ildefonso family, father Roberto and daughter Paloma, and represents the apex of their winemaking tradition. Very expressive, elegant and complex with ripe fruit, mineral notes, sweet spices, chocolate aromas and intense toasts. Powerful, tasty, round and very smooth. We find again black berries, mineral notes, chocolates with roasted aromas. Very long after taste. The soil is formed by sediments of sand, clay and limestone, which produce a dark lime-bearing topsoil, with fine and coarse sands. This year we had low rain falls getting very healthy bunches. Besides, cool nights and not very hot days at the end of the cycle were excellent for a complete ripening of the grapes, full of nuances. The fruit is manually selected and picked in small cases. After destemming the grapes are stored in 2.000 liter open fermenter tanks and cold maceration at 8ºC during 8 days. Three times a day the cap of the skins is submerged manually (pigeage) and after the alcoholic fermentation is finished at a controlled temperature, the wine is macerated until the wine maker determines the appropriate extraction polyphenols. The malolactic fermentation is carried out in new French oak barrels. The wine was aged in new French oak barrels for 16 months, followed by another 12 months minimum in the bottle. 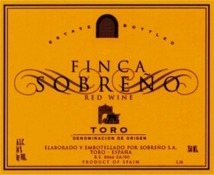 "The 2014 Finca Sobreño Ildefonso is a Tinta de Toro selection from 60-year-old vineyards fermented with indigenous yeasts and matured in oak barrels for 18 months with rackings every six months. It's serious and combines power and elegance, it shows very good balance and freshness and fine-grained tannins. Great showing. 50,000 bottles were filled in May 2018. - Luis Gutierrez"
"The tiny production 2014 Ildefonso Toro is also all Tempranillo that spent 16 months in new French oak followed by a year in bottle before being released. It has more black and blue fruits, with subtle violet and chocolate notes, medium to full body, a stacked mid-palate, and a big finish. It’s a rich, powerful wine that has loads to love. It too should easily keep for 10-15 years."